Esther Park has completed the 200-mile Run Across Haiti. Twice. She tackled mountain ranges and averaged a marathon distance each day. When you talk to her, you learn it’s not about her personal accomplishments, but her desire to help, connect with people and build stronger communities. For a long time Esther considered herself a casual runner. It wasn’t until she experienced tragedy that she started to take running more seriously. When her mother passed away in 2006, running became her outlet. Esther found a home in the running community in Los Angeles. She began to get involved with community runs and running groups and connect with runners in the area. Her connections soon led her to the Run Across Haiti. 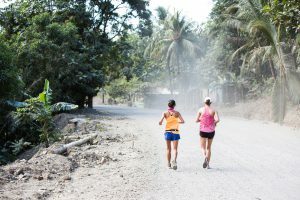 Run Across Haiti is an 8-day 200-mile run that works to raise awareness and funds to help end poverty in Haiti by placing families in dignified jobs. Haiti had always been something that weighed heavy on Esther’s heart. She had been looking for a way to help since the devastating earthquake in 2010, and even with some doubts, she applied. She was accepted in 2017, and the self-proclaimed “casual runner” was about to become the first female to complete the Run Across Haiti that year. As she prepared for her trip, training wasn’t without challenges. The optometrist and mother of one made the most out of every minute she had. She would log 1-2 hours of running before work and 4-5 hours on days off. However, during her 8-day journey, the running wasn’t the hardest part. Esther recalls breaking down when visiting families and experiencing doubts. She remembers wondering how she was really helping by running across the country. Despite her doubts, in 2017, Run Across Haiti raised over $150,000. In 2018, Esther went back to run across Haiti once more. Esther had built relationships with people and families she had met in 2017. On her second trip she was able to see some of them graduate from the program, now self-sufficient and able to provide for their families. These relationships and experiences gave her a broader perspective of life. The legacy Esther is leaving is truly one of community. She feels appreciative and thankful for what running has given her. Esther hopes that she can be that same support or comfort for someone else. If you know someone who motivates you or have an inspiring story to share submit it here. Sign up to celebrate 5 years with us and become part of the LaceUp Legacy.